WILLEMSTAD - The first preliminary calculations regarding the economic development in Curacao indicate a decrease of 1.1 percent in 2014. The percentages relate to the real developments, which means that they are corrected for price developments. This is evident from the data that the Central Bureau of Statistics Curacao (CBS) announced this week. Economic growth is calculated from the volume growth in the manufacturing and economic developments. These data are still preliminary, since the CBS does not have full details of all industries. The economic indicators are statistics that indicate the current state of the economy of a country depending on a specific area of the economy (such as industry, employment, trade, etc.). Since 2009, Curaçao has been in an economic stagnation. This refers to a period of sluggish economic growth, economic development, for example around zero percent. In 2014, the economic development has further deteriorated by 0.3 percentage points compared with 2013. The slow development in Curacao is also affected by inflation, which is 1.5 percent in 2014. The decline in economic activity in 2014 has mainly taken place in the sectors "agriculture, fisheries and mining" (-4.1%), "Government" (-3.6%), "Trade" (-3.2%), "Construction" and "Transport and Communication" (-2.8%), "Utilities" (-2.4%), "Business services" (-2.3%), "Financial intermediation" (-2, 1%), "Industry" (-0.9%), "Other services and private households" (-0.6%). The added value of agriculture, fisheries and mining fell by just over 4%, which was around the same rate in the previous year. In 2014, the provisional value of government operations decreased. The contribution to the economic development of the real government was less than in 2013. The activities in the trade market decreased by more than 3 percent. This is attributable to a decline in imports of goods and services and the various trading companies in 2014. Both in the construction industry and in transport and communication, there is an observed decline of 2.8 percent in economic activities. In the construction, among other things, there was less progress in production of building materials. In transportation certain activities declined in the port and airport. The airlift operations decreased due to a decline in the number of passengers, landings and the number of freight. The utility industry is down by more than 2 percent in 2014. In this industry, there is a reduction in the volume of activity observed of water and electricity. Also, the activities of the financial services decreased by 2 percent. The main indicators suggest that the real added value of local banks has declined; this added value also has more weight in the industry. The international financial services indicate an increase. The activities in the industry decreased by a sharp decline in ship repair that had affected the entire sector despite progress in refining production and other production activities of enterprises in 2014. Furthermore, growth of economic activities in 2014 occurred primarily in the sectors "Hotels and restaurants" (5.4%), "Education" (2.2%) and "Health Care" (1.5%). In 2014 the sector hotels and restaurants have improved compared to the year 2013. The number of tourists from South America that stayed overnight in Curacao rose 4 percent and the North American region, the number fell by 8 percent in 2014 compared to 2013. The number of tourists from the Caribbean fell by 14 percent, while the number of tourists from Europe, have improved 6 percent. The total number of tourists staying overnight has increased by 6 percent and the total number of visitors was around 3 percent more in 2014. This growth has led to a higher occupancy rate of over 70 percent in hotels. According to the "World Economic Outlook" of the International Monetary Fund in 2014, the growth of the world economy was 3.4 percent. In 2014, the economic development remained the same as in 2013. This was mainly due to emerging and developing economies, such as China, whose economy has grown by just under 7.4 and the ASEAN-5, which show a lower growth of 4.6 percent in 2014. Of the developed economies like the United States economy in 2014 shows an increase of 2.4 percent. In the Eurozone, the economy progressed by only 0.9 percent. The economic development of Latin America and the Caribbean shows a slower growth of 1.3 percent in 2014. The Caribbean region shows a growth of 4.7 percent in 2014. 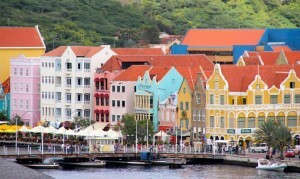 Economic development in Curaçao compared with the Caribbean region has deteriorated.